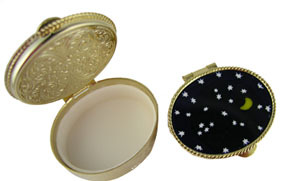 Pillbox of goldtone metal with Florentine Scrolling and Venetian Millefiori glass top. 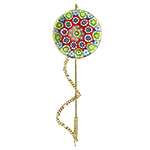 The millefiori patterns vary as they are each handmade with the famous Moretti glass canes. Inside the box is a plastic liner. Size is approximately 1.6 inche long and 1.2 inches across.